As most of you know, we sell a selection of Articles on Etsy.com. Why Etsy? Because of its reputation as a respected, handmade driven and well presented online shopping experience. We also happen to love a lot of the gorgeous things on offer there. Truth is, UnRuley Articles is a very, very small piece of the ever expanding Etsy empire. It can be challenging to get our voice heard in the middle of all their enticing handmade commerce. Enter UK Etsy, a newly inspired contingent of UK based Etsy shop owners passionate about making Handmade more visible and accessible to mainstream shoppers in Britain and worldwide. 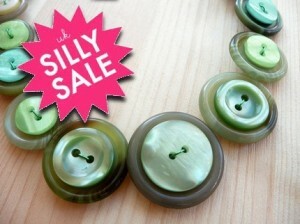 They’ve come up with a spiffy idea to help both UK Etsy shop owners and their intrepid customers: Throw a Silly Sale! They’ve invited UK shops to participate in a one day sales event. As you can guess we were only too delighted to jump on the Silly Sale bandwagon! The Silly Sale officially starts at 8pm Friday 8th (GMT) and ends at 8pm Saturday 11pm Friday 15th (GMT) There are buckets of shops practically throwing their handmade goodness at you! Luckily, many of the shops started their sales early. We launched our Silly Sale at midnight last night, offering 10% off certain Silly Sale Articles with Free Shipping. You can find a list of those Articles here or view our Special Offers page. A big part of the Silly Sale is about encouraging shop owners to network and collaborate with each other. To get the word out to the masses, not just in the UK, but worldwide. This is a concept I ADORE. Word of mouth is a great way to generate commerce. And let’s face it, we all need a little (or a lot) of help in the commerce department these days. Much of the networking is happening within the Etsy community via Treasuries (Ben has blogged about Treasuries here). While I love me some Treasury goodness, I’d like to go beyond the confines of Etsy and bring our UK Silly Sale deeper and further into the internets. Which is why I’m here, typing this blog and posting on our Facebook Fan Page to encourage our readers to be silly for a day (or a lifetime if you’re me) and take advantage of all the Silly Sale items UK Etsy has to offer, most of us ship worldwide! Thank you and have a fantastic, and silly, Friday! The sale has been extended! Now 10% through to Friday.